June 2, 2013 - Rolls-Royce’s Trent XWB engines have run for the first time on the A350 XWB (MSN1) following the start-up of the Auxiliary Power Unit (APU), as part of the preparations for the aircraft’s maiden flight. The A350 XWB is the all-new mid-size long range product line comprising three versions and seating between 270 and 350 passengers in typical three-class layouts. The new family will bring a step change in efficiency compared with existing aircraft in this size category, using 25 per cent less fuel and providing an equivalent reduction in CO2 emissions. Scheduled for entry-into-service in second half of 2014, the A350 XWB has already won 616 firm orders from 34 customers worldwide. The Airbus A350 XWB is a family of long-range, wide-body jet airliners under development by European aircraft manufacturer Airbus. The A350 will be the first Airbus with both fuselage and wing structures made primarily of carbon fiber-reinforced polymer. It will carry 250 to 350 passengers in three-class seating, depending on variant. Carbon-fiber-reinforced polymer, carbon-fiber-reinforced plastic or carbon-fiber reinforced thermoplastic (CFRP, CRP, CFRTP or often simply carbon fiber), is an extremely strong and light fiber-reinforced polymer which contains carbon fibers. The polymer is most often epoxy, but other polymers, such as polyester, vinyl ester or nylon, are sometimes used (see GAO safety concerns in the use of carbon fibers in aircraft). The A350 was originally conceived in 2004 as a widely new design, but with a fuselage based on the A330. This was rejected by some prospective customers. 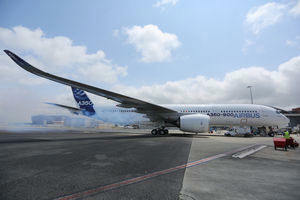 The 2006 redesigned A350 was named by Airbus as the A350 XWB, where the XWB stands for eXtra Wide Body. Airbus stated that it will be more fuel-efficient and have operating costs up to 8% lower than the Boeing 787. The Trent XWB is a series of turbofan engines, developed from the RB211 and it is used exclusively for the Airbus A350 XWB. The first engine test on a static test-bed was made in June 2010 and on Feb 18th 2012 Airbus announced that the Trent XWB had successfully made its maiden flight aboard Airbus’ dedicated Airbus A380 “Flying-Test-Bed” Certification for the early engine variants was achieved in 2013.